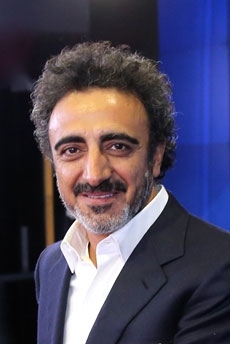 Born into a family of Turkish cheese and yogurt makers, Hamdi Ulukaya landed in New York at the age of 23 with a little money and the intent of learning English. That plan soon turned into a dream of producing affordable, natural Greek yogurt in the United States, and providing more access to delicious, healthy food. In 2005, the Turkish cheese-maker received a piece of junk mail from a local real-estate company – the local Kraft Foods plant closed down. Ulukaya saw this as an opportunity and bought the plant with the help of a loan from the U.S. Small Business Administration. He spent the next 18 months learning everything he could to create the perfect Greek yogurt recipe. In 2007, Chobani (meaning shepherd in Turkish) opened for business. From a factory that has grown from five employees to two plants in the US, Chobani is the #1 yogurt brand in the US with $1 billion in revenue. Forbes has called him “the Steve Jobs of yogurt” and Ernst & Young named Ulukaya the World Entrepreneur of the Year in 2013. As a believer in “doing good business,” Ulukaya created the Chobani Foundation which directs 10% of brand profits to charitable groups working for positive and long lasting change. “A cup of yogurt won’t change the world, but how we make it just might,” Ulukaya said. Earlier this month, Ulukaya launched the Chobani Food Incubator to inspire more entrepreneurship in the food industry – and to make “Good food for more people.” He wants to start a food revolution and help nurture, support and celebrate today’s entrepreneurs. As an inaugural member of the Presidential Ambassadors for Global Entrepreneurship (PAGE) initiative, Ulukaya wants to help more Americans and people around the world believe in and gain access to their own dreams. Among the many events he has attended to inspire others by sharing his entrepreneurial journey, Ulukaya recently participated in the Social Innovation Summit and Entrepreneurship Summit, both hosted in New York City. 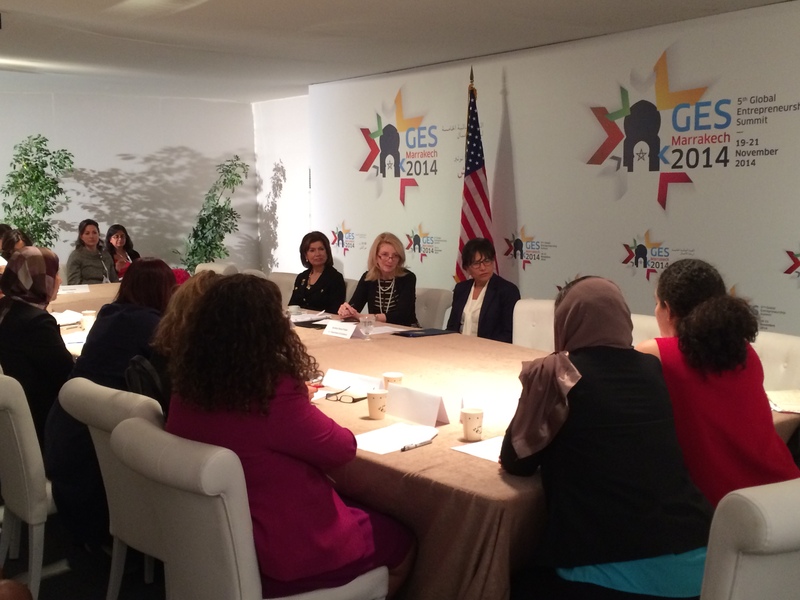 U.S. Secretary of Commerce Penny Pritzker celebrated Women’s Entrepreneurship Day this week as part of the Global Entrepreneurship Summit (GES) in Marrakesh, Morocco. Secretary Pritzker helped lead the U.S. delegation to the Summit to demonstrate the U.S. government’s continued commitment to fostering entrepreneurship around the world. More than 3,000 entrepreneurs at all stages of business development, business leaders, mentors and high-level government officials gathered for the 5th Annual Global Entrepreneurship Summit. At last year’s GES in Malaysia, President Obama asked Secretary Pritzker to chair the Presidential Ambassadors for Global Entrepreneurship (PAGE) initiative, and she convened the first-ever meeting of that group this past April. PAGE is made up of 11 well-known American entrepreneurs who are dedicating their time and resources to inspiring the next generation of entrepreneurs in the U.S. and abroad. Three PAGE members joined the Secretary at this year’s GES, including Alexa von Tobel, Founder and CEO of Learnvest, Daphne Koller, Co-Founder and President of Coursera, and Hamdi Ulukaya, Founder and CEOS of Chobani. In honor of Women’s Entrepreneurship Day, Secretary Pritzker delivered the keynote address to approximately 300 women entrepreneurs. She discussed America’s leadership in empowering entrepreneurs at home and abroad and touted how a strong entrepreneurial society can lead to greater economic growth, stability and security, and a rising middle class. During her remarks, she also addressed the challenges that face women entrepreneurs today including lack of access to capital, training in vocational and technical skills, and access to information and technology. Structural obstacles also create enormous difficulties for women and men who want to grow a new business and Secretary Pritzker highlighted some of those obstacles. Secretary Pritzker discussed how female entrepreneurs all over the world need a change in culture to support their work. She expressed that countries need a strong educational system that produces students able to think broadly and creatively, and to accept and take risks while also stressing that countries need to have laws that make it easy for innovators to both start a company and wind it down. During her first day in Morocco, the Secretary also spoke with representatives from 80 American Chambers of Commerce headquartered throughout Africa, who were also gathered in Marrakesh for the Global Entrepreneurship Summit. She discussed the Department’s Doing Business in Africa campaign, designed to leverage the power of the U.S. business community in Africa and encouraged U.S. trade promotion and investment to all regions of Africa. 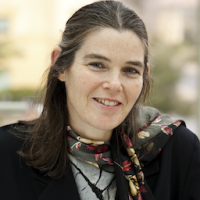 Daphne Koller began her career in education when she joined the Computer Science Department at Stanford University in September 1995. While she enjoyed teaching and leading research on probability theory and artificial intelligence, Koller thought about new ways that could engage more people in education – she wanted to share it with everyone, not just her students. In 2012, Koller and a fellow professor, Andrew Ng, started Coursera, a leading platform of Massive Open Online Courses (MOOCs), to change education globally. Their vision was to provide universal access to the world’s best education. As the co-founder and president of Coursera Inc., Koller has made all of her company’s online courses accessible for free. It gives both students and universities the opportunity to experiment with online education pedagogy and combine online course materials with on-campus learning experience. “Education is the great motivator of people to achieve access to a better life,” she said. Koller is ranked among the CNBC’s NEXT List, which includes entrepreneurs and executives who are working on innovative solutions to global challenges. Time Magazine has recognized her as one of the “100 Most Influential People for 2012,” and Fast Company has named her a “creative leader” in the Most Creative People in Business 1000 list. 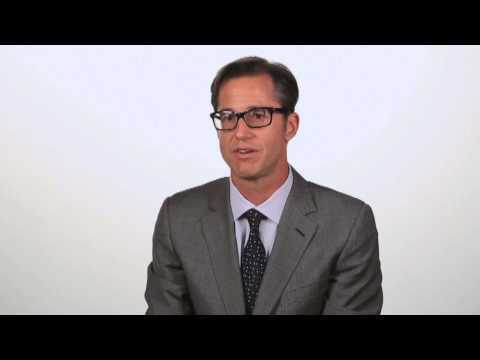 With the advancement of technology, Koller is able to promote higher education to a new level. The company now offers over 800 online courses instructed by professors at 115 colleges and other institutions, including some of the Ivy Leagues schools – Yale University, Columbia University, University of Pennsylvania, and Princeton University. Coursera now attracts more than 10 million users from every corner of the world. After two years of being a professor and running her company, Koller chose to devote all her time to Coursera. She considers entrepreneurship as the basis for prosperity and stability, and sees the PAGE initiative as a way to make this area available to everyone in the United States and other countries. This week, Koller joined Secretary Pritzker at the Global Entrepreneurship Summit in Marrakesh, Morocco. She gave a presentation on innovation, technology and entrepreneurship, and discussed ways to empower entrepreneurs to turn their ideas into successful businesses, grow their ventures, and ultimately create jobs. 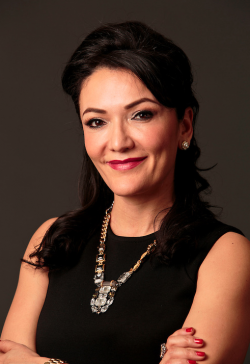 The daughter of entrepreneurs, Nina Vaca grew up believing that entrepreneurship and civic leadership went hand-in-hand. She likes to say that she “had a front row seat to what it meant to be an entrepreneur,” working in the family travel agency business by day and attending chamber and civic events at night. Since starting her award-winning IT services firm in 1996, Vaca has continued that legacy both as an entrepreneur and a visible leader and advocate in the business community. Today, Vaca owns and operates The Pinnacle Group, which includes several companies founded by Vaca, including its flagship, Pinnacle Technical Resources, Inc., an award-winning information technology services provider to the Fortune 500 founded in 1996, and Provade, Inc., a global provider of vendor management software that Pinnacle acquired in 2011. Pinnacle is also a partner in My Plates, which is the sole provider of specialty license plates in the state of Texas, contributing millions of dollars in revenues to the state each year. Vaca sits on the corporate board of Comerica Bank, Kohl’s Coporation and was elected to the board of Cinemark, Inc. Nov. 13, 2014. She is strongly committed to philanthropic efforts and is a passionate advocate of issues impacting women and Hispanics in business. Through the USHCC Foundation, Vaca founded At the Table, an initiative supporting women entrepreneurs and business professionals, propelling them to higher levels of success and influence. Vaca was named Chairman of the USHCC Foundation in June 2014. In May, Vaca embarked on a trade mission to Ghana, along with Commerce Secretary Penny Pritzker and 20 American business delegates. Vaca met with local African business leaders at the Meltwater Entrepreneurial School of Technology (MEST) and Stanford Institute for Innovation in Developing Economies (SEED), where she shared her story of both success and failure to encourage others to become problem solvers with a perseverant attitude. With a father who designed his own clothes and a mother who was an actress, fashion was always in Tory Burch’s DNA. 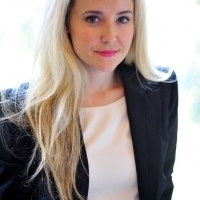 Having worked for world renowned fashion designers including Ralph Lauren and Vera Wang, Burch left her successful career in public relations to raise her three young children. At age 37, she started the Tory Burch company at the kitchen table in her Manhattan apartment. Her vision: to create designs that are both classic and affordable. From one single storefront on 257 Elizabeth Street, Burch has grown her namesake brand into a fashion empire in less than 10 years. Her company, valued at more than $3.5 billion, now has more than 140 stores in 50 countries and over 2,000 employees. The collection includes ready-to-wear, shoes, handbags, accessories, watches, home, fragrance and beauty. 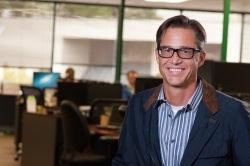 As an entrepreneur and a member of PAGE, Burch has two top priorities: to serve as a mentor to aspiring entrepreneurs, and to help young innovators access the capital they need to turn their bright ideas into thriving business enterprises. Burch created the Tory Burch Foundation (TBF) in 2009 to support the economic empowerment of women entrepreneurs and their families. It provides women with access to capital, mentoring and networking opportunities, as well as entrepreneurial education. When she was graduating from college, Alexa von Tobel realized she had received no guidance on personal finance. Her personal experience inspired her to start a company when she was just 25, with the hopes that she could make personal investing and budgeting approachable. The online financial planning company LearnVest has now brought financial planning to thousands of Americans, making it more accessible and affordable than ever before. Forbes calls her a “personal finance guru,” Fortune has named her as a “Most Powerful Women Entrepreneur,” and Marie Claire Magazine chose her as one of 18 Women Changing the World. 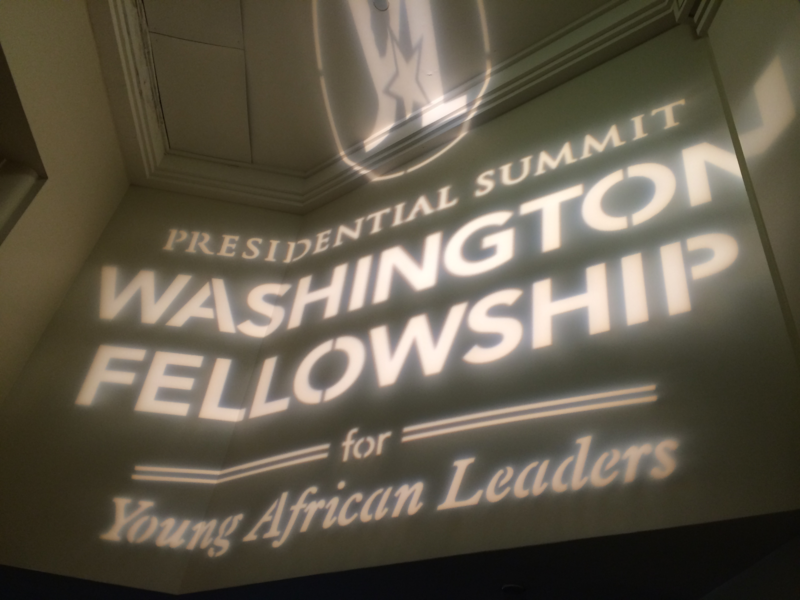 With a palpable enthusiasm for encouraging others to follow their passions, von Tobel shared her experiences and expertise at the inaugural Young African Leaders Initiative (YALI) Summit. Launched in 2014, YALI is a signature effort that connects young African leaders to leadership training opportunities at some of America’s top universities to help expand their skills and knowledge so they can foster entrepreneurial change in their communities and countries. His first job out of college was at Procter & Gamble, and a few years later he became a marketer for Pizza Hut. You may now know him as the co-founder of AOL who ultimately brought generations of Americans online and made “You’ve got mail” a household phrase. You may also recognize him as an independent with friends in both political parties, who helped broker some of the finer points of the JOBS Act, the legislative package of bills that ease regulations on startups and potential Initial Public Offerings (IPOs). 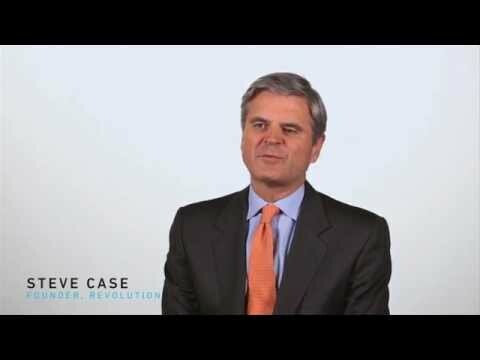 Today, Steve Case is the founder and partner of Revolution, a Washington, D.C.-based investment firm that believes great companies and ideas can be found throughout the country, not just in Silicon Valley. 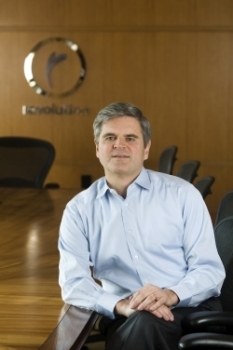 Steve Case was appointed by President Barack Obama to be chairman of the Startup America Partnership, a nonprofit that fosters private-sector investment into job creation. He also joined the President’s Council on Jobs and Competitiveness, where he helped lead a subcommittee looking at job creation and entrepreneurship. President Obama believes "Entrepreneurs embody the promise of America: the idea that if you have a good idea and are willing to work hard and see it through, you can succeed in this country. And in fulfilling this promise, entrepreneurs also play a critical role in expanding our economy and creating jobs." With that in mind, the President announced in 2009 the creation of the Global Entrepreneurship Summit (GES), a platform intended to facilitate the exchange of views and ideas between global business leaders and entrepreneurs and strengthen alliances among them. Previous summits have been hosted by the United States, Turkey, the United Arab Emirates, and Malaysia. 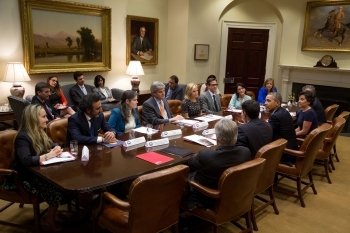 At last year’s GES in Malaysia, President Obama asked Secretary Pritzker to chair the Presidential Ambassadors for Global Entrepreneurship (PAGE), making her the Administration's point person on entrepreneurship. In April, Secretary Pritzker chaired the first PAGE meeting, bringing together a group of America’s most inspiring innovators to serve as ambassadors for global entrepreneurship. Six months later, the PAGE initiative continues to gain momentum, with PAGE members actively engaged in promoting innovation here at home and abroad. To celebrate six months of the PAGE initiative, we are launching a video blog series, featuring our very own PAGE members who will share with you why entrepreneurship is important and why it is integral that the public and private sectors work together to make our economy stronger and more innovative. Please visit http://beta.commerce.gov/PAGE to learn more about PAGE and the ambassadors who are committed to sharing their time, energy, ideas, and experience to help develop the next generation of entrepreneurs in the United States and around the world. Among many events, here is a sample of what PAGE members have been doing to create an environment where creativity, innovation, and entrepreneurship can grow and thrive. Secretary of Commerce Penny Pritzker previews the upcoming 5th Global Entrepreneurship Summit in Marrakech, Morocco. Earlier this week, U.S. Secretary of Commerce Penny Pritzker met with President of Korea Park Geun-hye, the first female President in South Korea, as well as Minister of Trade, Industry, and Energy (MOTIE) Yoon Sang-jick, and Minister for Health and Welfare, Moon Hyung-pyo. The meetings with Korean leaders are part of Secretary Pritzker’s trade mission she is leading with 20 U.S. companies to explore new opportunities for American firms in the health care and energy sectors. Three years ago, the U.S.-Korean Free Trade Agreement went into effect, providing the foundation for stronger economic partnerships and growing trade and investment relations between the two countries. During the mission, Secretary Pritzker reaffirmed President Obama’s commitment to deepen U.S. engagement in Asia and emphasized that her visit to Korea is a reflection of the commercial and economic component of the President’s rebalance to Asia. 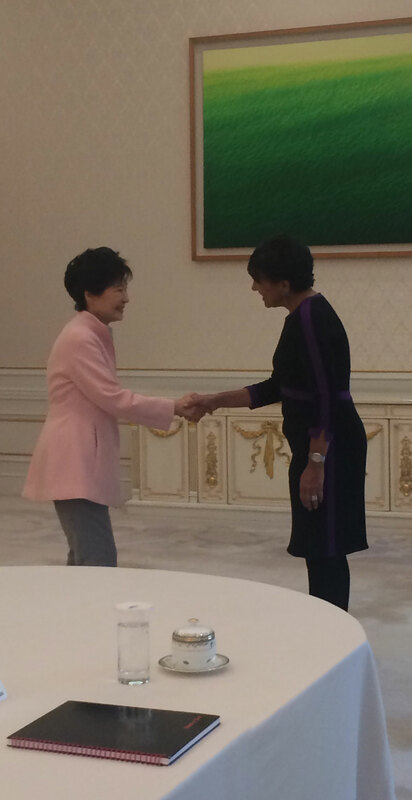 Secretary Pritzker and President Park discussed ways to continue moving both economies forward in the 21st century by seeking new ideas to expand business-to-business ties. In addition, the Secretary applauded President Park’s vision of building a “Creative Economy” in Korea by spurring new business opportunities, industries, and jobs through innovation and entrepreneurship. The meeting concluded with Secretary Pritzker saying that the global business community needs to continue to innovate and explore creative and alternative ways of doing business to grow and stay competitive. Secretary Pritzker also met with Minister of Trade, Industry, and Energy (MOTIE) Yoon Sang-jick to discuss entrepreneurship and the importance of small and medium-sized enterprises (SME) being integrated into the global business community. 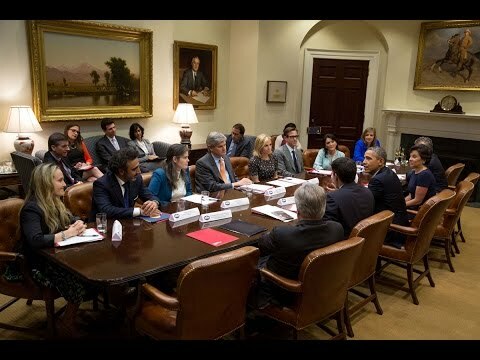 As President Obama’s chair of the Presidential Ambassadors for Global Entrepreneurship (PAGE) initiative, Secretary Pritzker is working with leaders and businesspeople throughout the world to help create an environment where creativity, innovation, and entrepreneurship can grow and thrive. The Secretary also asked Minister Yoon for a commitment to work together to expand industry engagement under the U.S.-Korea Clean Energy Policy Dialogue, by including business participation. Delegations from both countries met in June in Seoul to discuss clean energy technology cooperation, marking progress in smart/micro grids, fuel cells, and energy storage research and development. The Clean Energy Policy Dialogue will continue those talks and broaden the focus to discuss energy policy issues. Lastly, the Secretary met with Minister for Health and Welfare, Moon Hyung-pyo. With South Korea’s total market for drugs and medical device products reaching roughly $21 billion, the two leaders discussed how the United States and Korea can build new partnerships in the area of healthcare as well as Korea’s interest in becoming a global hub for clinical trials. The main focus of Secretary Pritzker’s visit is to introduce new-to-market firms and expand the market presence of American medical, pharmaceutical and energy-related firms that have innovative products and services. Developments in these sectors can be harnessed to improve the standard of living for citizens of both countries. Since taking office a year ago, Secretary Pritzker has spoken to over a thousand business leaders and more than one-third of Fortune 500 CEOs, and one of the top concerns that they have shared is finding the right workers to fill available jobs. To ensure the economy’s long term competitiveness, the United States must maintain a strong workforce with the skills that businesses need. That is why the Department of Commerce is making workforce development a top priority for the first time ever. In her discussion with Isaacson, Secretary Pritzker talked about some of the initiatives that the Commerce Department is leading to equip the American workforce with skills for jobs in thriving industries. For example, the Department recently launched a membership call for the National Advisory Council on Innovation and Entrepreneurship (NACIE), an advisory council that will assists the Department in finding new approaches to industry-led skills training. This spring, Secretary Pritzker also joined President Obama and Vice President Biden to announce a combined $600 million in Trade Adjustment Assistance Community College and Career Training (TAACCCT) and apprenticeship grants, which will enable a number of communities to train workers for challenging careers in growing American industries, such as advanced manufacturing, IT, and healthcare. Today U.S. Secretary of Commerce Penny Pritzker visited Cincinnati, Ohio for the “Rise of the Rest” Road Tour to celebrate America’s entrepreneurial spirit and bring attention to emerging startup economies in communities across the United States. The four-city tour, taking place this week in Detroit, Pittsburg, Cincinnati and Nashville is hosted by Chairman and CEO of Revolution and Presidential Ambassadors for Global Entrepreneurship (PAGE) member Steve Case. PAGE is a first-of-its-kind collaboration between eleven of America’s most inspiring and prominent entrepreneurs who are using their experience and expertise to help spur business creation in the United States and around the world. Entrepreneurship is a key driver of economic growth and job creation. Startups account for 20 percent of new jobs created in the United States and are responsible for adding net new employment to the economy. Secretary Pritzker’s visit to Ohio today is part of the Commerce Department’s ongoing efforts to support and highlight America’s thriving entrepreneurial spirit, celebrate our startup culture, and inspire the next generation of entrepreneurs. Secretary Pritzker began the day in Cincinnati by delivering remarks about the importance of entrepreneurship at a breakfast event with Cincinnati business owners and aspiring entrepreneurs. In her remarks, she discussed the Administration’s efforts to engage with business leaders and local leaders to foster an economic environment that encourages innovation and entrepreneurship, which spur job growth and competitiveness and promote economic development. Secretary Pritzker then hopped on the bus and headed to Dotloop, a web-based company focused on creating a platform that would simplify real estate transactions. She then toured Cintrifuse a start-up incubator in downtown Cincinnati where she met with a number of entrepreneurs looking to turn their ideas and inventions into new products and technologies. 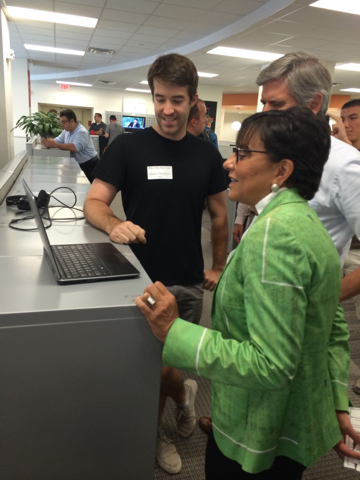 After her Cintrifuse visit, Secretary Pritzker and Steve Case visited Roadtrippers, a web and mobile app for planning road trips. All of the sites Secretary Pritzker visited today demonstrate the power and potential of great American business ideas. Innovation and entrepreneurship are key drivers of economic growth, in the United States and around the world. 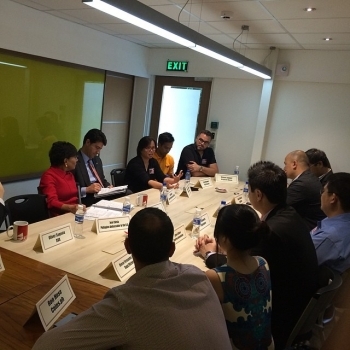 As part of her commercial diplomacy mission to the Asia-Pacific region this week with leading American CEOs, U.S. Secretary of Commerce Penny Pritzker participated in a roundtable with Philippine entrepreneurs to learn more about the business environment in the Philippines and discuss ways that the Obama Administration can support business creation. The roundtable was hosted by Kickstart, a startup incubator, and IdeaSpace, a non-profit that supports technology entrepreneurs. 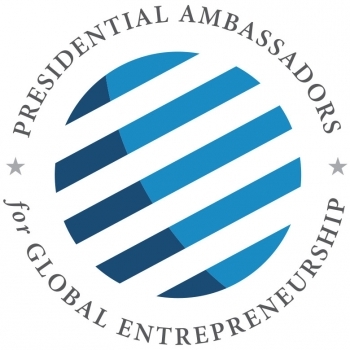 Two months ago, Secretary Pritzker launched the Presidential Ambassadors for Global Entrepreneurship (PAGE) initiative, which President Obama announced last fall. PAGE is a partnership between U.S. government and the private sector to inspire business creation in the United States and around the world. As the inaugural members of PAGE, 11 successful American entrepreneurs committed to traveling the world to provide access to mentorship, education and other opportunities for aspiring entrepreneurs. Today’s roundtable is part of a series of discussions that Secretary Pritzker is holding to learn more about the opportunities for new business creation, as well as the obstacles that entrepreneurs face in different countries. During the Secretary’s trade mission to the Middle East in March, she sat down with 15 Saudi entrepreneurs in Riyadh and learned about their plans for growth and what they needed to foster an entrepreneurial community. Also, two weeks ago, she visited an incubator where Ghanian entrepreneurs were developing businesses that served customers in the United States and Europe. These forums are an invaluable chance for the Secretary to learn about barriers to things like capital and education. Secretary Pritzker's trip demonstrates that United States is firmly committed to deepening U.S. engagement with the Asia-Pacific region, and recognizes that there is tremendous opportunity for mutually-beneficial growth in the ASEAN region. By helping to remove barriers to new business creation, the Commerce Department is working to unlock the entrepreneurial spirit that will generate prosperity for both the Philippines and the United States. Innovation is key to supporting economic growth and creating jobs in the United States. In order to ensure that the United States stays competitive, the Department of Commerce works to create the conditions that empower Americans to turn their ideas into successful businesses, grow their ventures, and create jobs. Wednesday, on the third day of the Ed Innovation Summit in Scottsdale, Ariz., Secretary Pritzker spoke with former Washington Post executive editor Len Downie about what the Department of Commerce is doing to support innovation. Secretary Pritzker shared that since taking office almost one year ago, she has spoken to more than 1,000 CEOs and business leaders, including more than 150 of Fortune 500 companies, around the country. One of the top concerns they have shared is the challenge of finding the workers with the right skills to fill available jobs, which is a threat to our nation’s long-term competitiveness. In order to best equip workers for the jobs that are available now, and will be available in the future, Secretary Pritzker has made skills development a top priority for the Department of Commerce for the very first time. Central to this effort is breaking down silos between the public and private sectors to create programs that match workers’ skills to the needs of businesses. The Department of Commerce is working closely with the Departments of Education and Labor, as well as businesses, training organizations, academic institutions, and state and local governments to do just that. Earlier this month, Secretary Pritzker traveled to Pittsburgh with President Obama and Vice President Biden, where they announced $100 million in competitive grants to support apprenticeships and a nearly $500 million grant competition to support partnerships between community colleges, employers, and industry association that will help develop job-driven training programs -- a first for the Department. Another important aspect driving innovation is encouraging a start-up culture in which entrepreneurs can thrive. However, as Secretary Pritzker mentioned during her Ed Innovation talk, the rate of new business formation is actually declining in the United States. Research indicates that new and young companies are responsible for virtually all new job growth across the United States, so supporting entrepreneurship is a priority for the Administration. 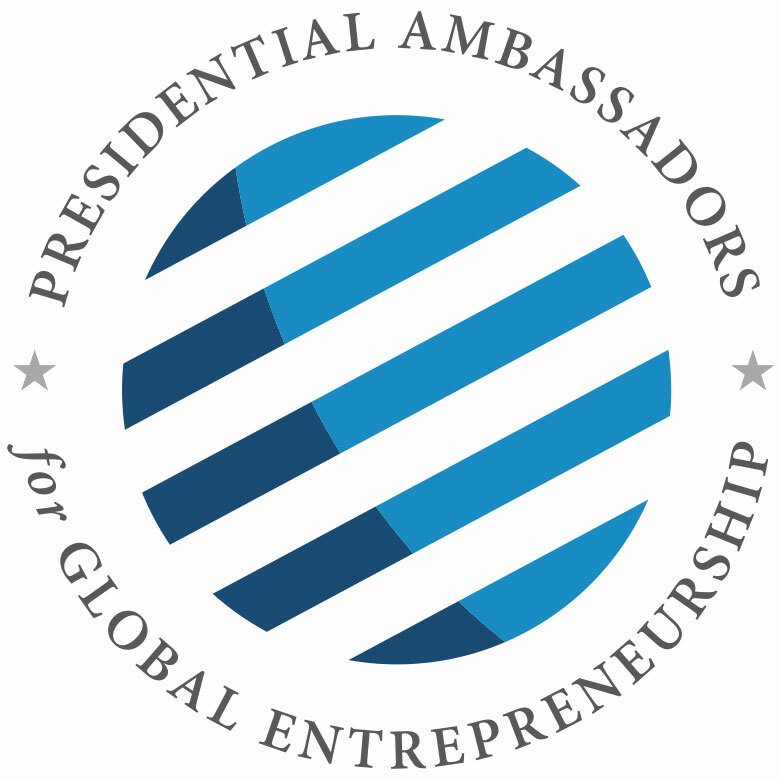 Earlier this month, President Obama announced the inaugural members of the Presidential Ambassadors for Global Entrepreneurship (PAGE). Chaired by Secretary Pritzker, PAGE is an initiative to help develop the next generation of entrepreneurs across the globe and right here in the United States. The 11 PAGE members will participate in an ongoing dialogue with policy makers globally to discuss how to create an environment in which creativity, innovation, and entrepreneurship can grow and thrive. They will also participate in outreach and mentorship activities to help promote a start-up culture, and energize their own personal and professional networks to challenge, inspire, and educate budding entrepreneurs. Following her armchair discussion at the Ed Innovation Summit, Secretary Pritzker toured SkySong, the ASU Scottsdale Innovation Center, and met with local entrepreneurs. SkySong is a mixed use development designed to help companies grow by providing business services and programs offered or facilitated by Arizona State University, which include access to new technologies, capital networks, and a skilled workforce. In her roundtable with SkySong's entrepreneurs, Secretary Pritzker discussed ways in which the federal government can serve as a catalyst to innovation. For example, the Department of Commerce protects entrepreneurs' intellectual property through the Patent and Trademark Office, enabling innovators to capitalize on their ideas. Another part of the Commerce Department, the Economic Development Administration (EDA), makes investments that help fund business incubators like SkySong. In fact, EDA helped create SkySong's technology transfer accelerator, known as Furnace, in 2012. The investments in entrepreneurs have already paid off for Arizona. According to a 2012 study by the Greater Phoenix Economic Council, SkySong-based companies, which range from start-ups to large companies like Ticketmaster and Recruiting.com, have generated more than $460 million in economic impact for the Greater Phoenix area since SkySong's inception in 2008. As part of its mission to help create an environment that stimulates economic growth and job creation, the Department of Commerce is dedicated to identifying and supporting successful programs for workforce training and entrepreneurship.